Gun powder horns from Java are exceptionally rare. 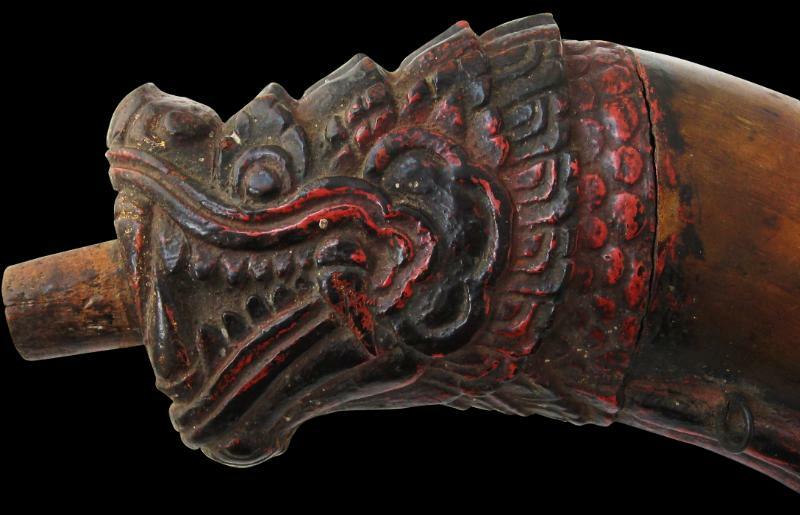 This example is in the shape of a snub-nosed naga or water serpent. The body is of water buffalo horn. The head, tail and underbelly are of carved wood with polychrome and traces of gilding. The form of the carving is typically Javanese and accords with the pre-Islamic cultural underpinnings of Javanese culture with its fascination with demons, spirits and serpents. The stopper no longer is present and six wire loops along the underbelly presumably allowed for additional adornment. Gun powder production has a long history on Java. In the battles that the Dipanagara, the Javanese prince who fought against the Dutch colonisers, staged in the 1820s, gun powder that was captured from the Dutch was used, but also it was acquired from local villages in the districts to the south of the central Javanese city of Yogyakarta. A former indigo factory was converted too into a gun powder factory. Local Chinese were also instrumental in smuggling gun powder to Dipanagara’s troops (Carey, pp. 609-10). Carey, P., The Power of Prophecy: Prince Dipanagara and the end of an Old Order in Java, 1785-1855, KITLV Press, 2008.